Are all your students learning well, getting good grades, scoring well on tests? I think that’s the case with a lot of schools. I think that’s why 9 districts have formed the Maine Cohort for Customized Learning (MCCL) and why Maine’s Education Commissioner Bowen is so actively pursuing customized learning. So if you want to read more about customized learning, what might you read? Take a look at these three books. All three focus on different approaches to and aspects of customizing learning. They all share the idea that we can customize learning by starting with learning targets and then students collaborating with their teachers to master those targets in interesting and meaningful ways. The 9 Maine districts who have become members of MCCL are exploring the Reinventing Schools Coalition (RISC) model. Delivering on the Promise by Rich DeLorenzo and team, provides a nice 30,000 foot view of how the approach was developed in one Alaskan school district, and of the components of the approach. 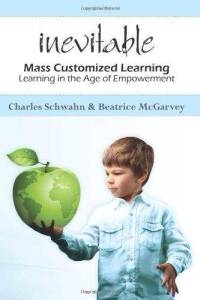 Inevitable, by Bea McGarvey and Chuck Schwann, both makes the case for mass customized learning, but also lays out a vision of what it might look like and how we might do it. My district has had members of the visioning committee (made up of educators and community members) and the entire administrative team read this book, as well as having made copies of the book available to community members. Commission Bowen had all his department heads read this book, and now asks each department how they are moving in that direction. Another approach to customized learning is student-designed standards-based projects. The Minnesota New Country School is given much credit for developing this model, and their work has been recognized by the US Department of Education, and others. Ron Newell has captured this work and makes clear the student-designed project approach in Passion for Learning. What are your favorite readings about customized learning? Have you read any of these books? What were your favorite parts? What are your thoughts about how the ideas in the books might come to life in your school? This entry was posted on October 22, 2011 at 10:53 pm and is filed under Curriculum and Instruction, Customized Learning, School Reform. You can follow any responses to this entry through the RSS 2.0 feed. You can leave a response, or trackback from your own site.